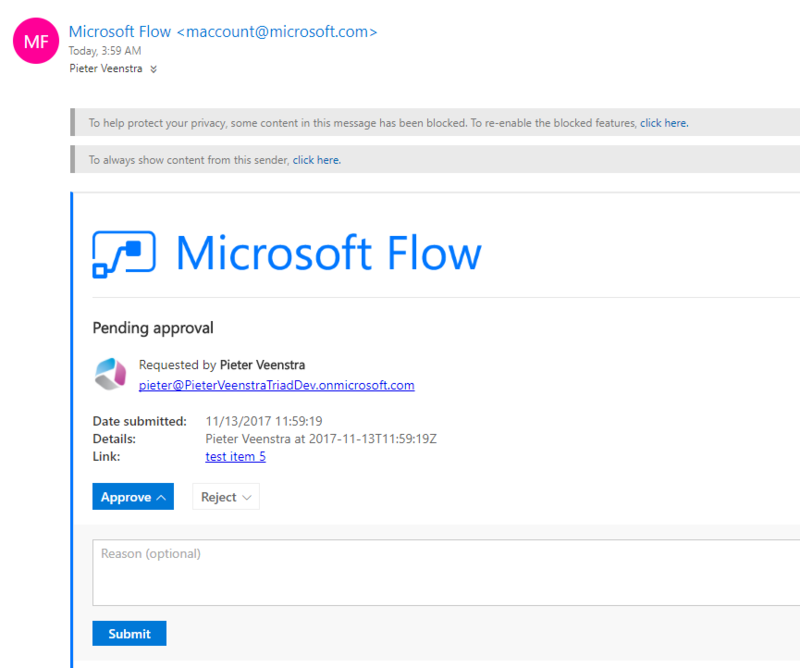 Home › Office 365 › Flow › Microsoft Flow- Do you approve? Microsoft Flow- Do you approve? As Microsoft Flow is replacing other workflow systems like SharePoint Designer Workflows, I’ve been looking into the options available. Over the last year I’ve seen from Flow moving from ‘That is not possible’ to a ‘Wow, can it do that too’! In the past I’ve seen many customers asking for approvals to be easier. Having to go to tasks simply didn’t work well enough and a simple email where you can reply with approve or reject was always a required option. 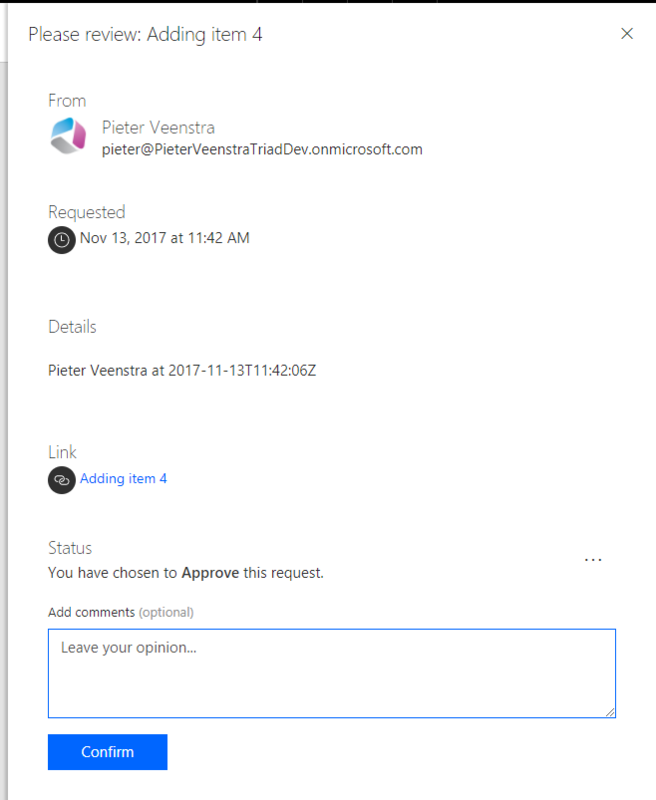 Microsoft Flow now sends out approval request emails with nice Approve and Reject buttons. All from a very easy to setup Flow. 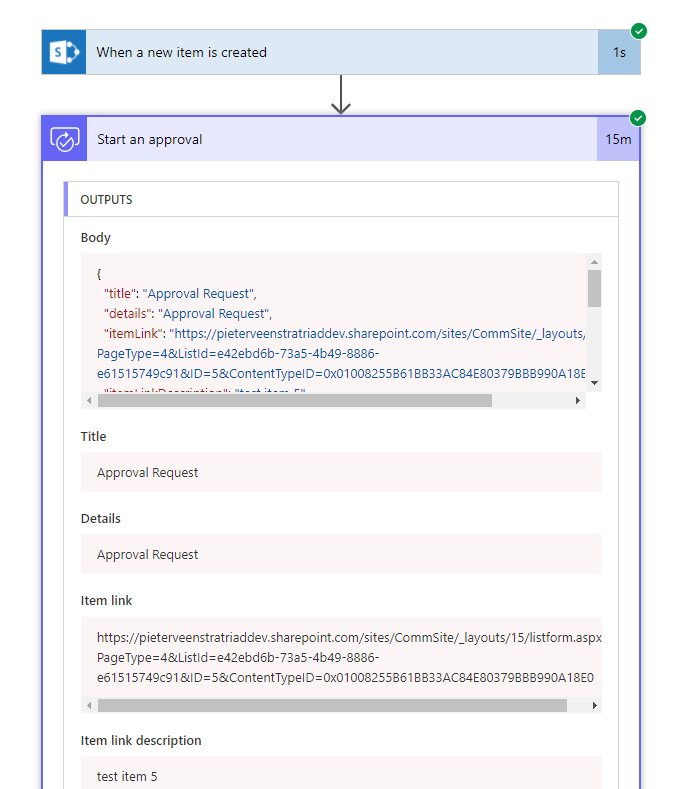 So imagine that we want to setup workflow that sends out an approval when an item created within a SharePoint Library. 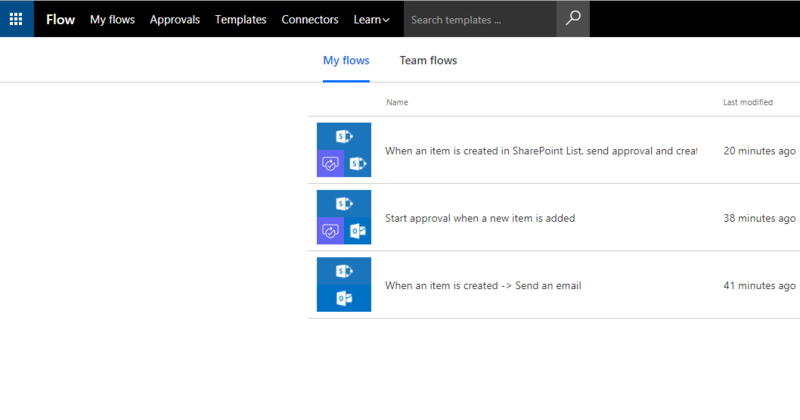 It will all start with creating a new Flow in your SharePoint list. Once you clicked on the Create a flow option you will be offered loads of templates. But so far I’ve often found issues with the templates and I’ve found just starting with a clean Flow the easier option. 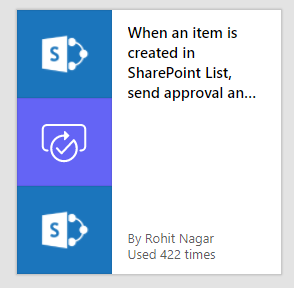 But today I’m going to use the template “When an item created in SharePoint List send approval and create item”, and I actually found that this template does quite q good job. So for example email that I received has already all the information in that that I could possibly expect from an approval email. There is a link to my list item. The approval and reject buttons give me the option to add a reason for the approval/rejection. And even here when you are trying to approve something in SharePoint there is a nice and easy to use interface that lets you approve your documents and lists items or anything else that could be there as a trigger in your Flow. 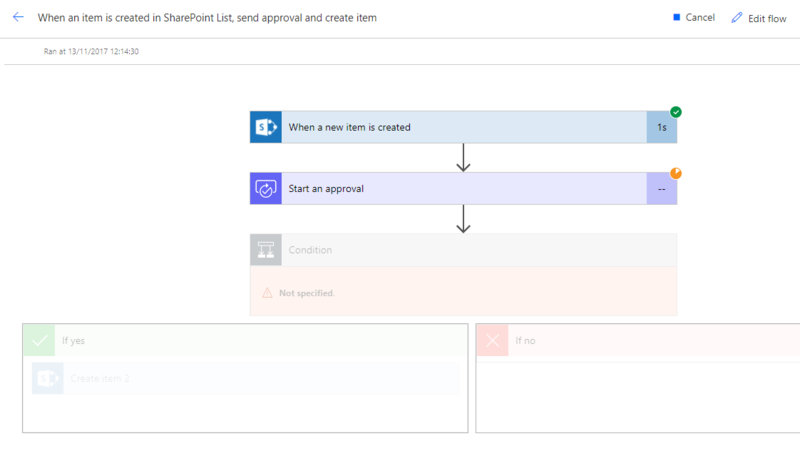 On thing that is however very different between the traditional SharePoint Designer workflows and Microsoft Flow is that you can’t see within the SharePoint list what has happened to your Flow. Has the item been approved or is the approval pending? Has the flow finished or is it still in progress? Also where do I find my comments back? Then Within the Run History you can see how often a flow has run. When you then click on the workflow instance you will get an exact update of the status. The completed steps will appear with little ticks, running steps will have a small clock/timer next to it and the greyed out steps have not started yet. This of course is great for developers, but is this really what we want to bother users with? Especially when you look at the details of the steps. The Start an approval step isn’t making it easy to find the approval status and comment. So I would expect that within the Flow you will need to include some steps that will update a status column within the triggering SharePoint item. ‹ Office 365 – SharePoint Online – Accessibility mode or PDF converter? Good one, am looking for a flow which will not allow user to get to the Flow page and should get the comments in the mail. I understand this has been a challenge to many guys. will stay tuned to see how it comes up. Thanks for your content.